Today's computers give us the power to split audio into hundreds or even thousands of bands and give each one a different effect treatment. At the simplest level, you could alter the static output level of each band, giving you an extremely flexible EQ, or alter these levels dynamically to create gating, compression or expansion effects in the spectral domain. These can provide far more radical results than the more typical multi-band dynamics plug-in or, alternatively, more refined ones, depending on personal taste! If a second audio file can be loaded into your plug-in, for even more advanced effects you could statically compare the EQ of your audio signal with it and attempt to match the two (aka 'EQ ripping'), or do this dynamically for vocoding or morphing effects that contain characteristics of both signals, such as 'talking' pianos or 'singing' drums. Once in the frequency domain, you can also mathematically manipulate each band, at which point the results start to get really intriguing.The sonic ground covered by multi-band spectral plug-ins is quite considerable, ranging from delicate transformations and subtle effects all the way through to sonic mangling of the most extreme and unexpected kind. Audio quality can also vary considerably, but there's plenty of choice, varying from freeware effects to complex commercial products; let's have a look at what's on offer. 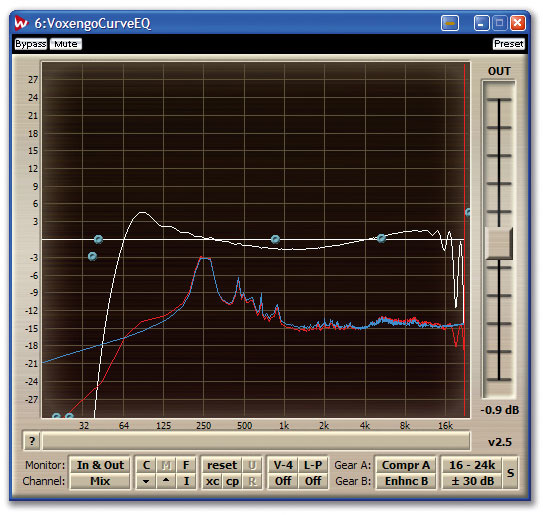 Once you have sufficient bands in an EQ, you can move beyond the peak and shelf responses of more traditional designs to generate any frequency-response curve you can imagine. This opens up a lot of possibilities, including surgically removing small details related to specific frequencies in an audio file, such as hums and buzzes that may each involve several harmonic components, but for most people it's the ability to 'learn' the frequency response of an incoming sound and subsequently apply this to another audio file that's most intriguing. 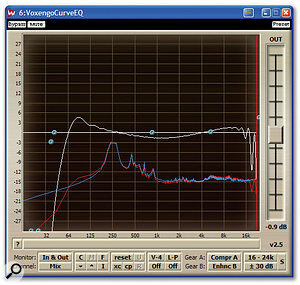 With up to 4096 bands of EQ, you can apply complex response curves (as shown above with Voxengo's Curve EQ) to simulate the foibles of hardware devices, learn the response of one file and apply it to another, or draw in your own exotic responses for special effect purposes (as demonstrated by Delaydots' Spectral Shaper). A very popular pastime is so-called EQ ripping, where you modify the frequency response of one of your own tracks to match that of a well-polished commercial offering. This technique can undoubtedly benefit some songs with similar arrangements and instrumentation, but it's not the panacea that some musicians think. For instance, you don't want every response ripple of the target track to be faithfully re-created in your destination track, particularly if the songs are in different keys, since peaks belonging to specific notes in one track will never correspond to those in the other one. Nevertheless, EQ ripping is certainly educational, especially since it can also be used to 'learn' the response curves of other hardware/software EQs, or indeed the frequency-response foibles of other hardware such as microphones, tube amps or tape machines. One of the first of these EQs to appear was Steinberg's 30-band Freefilter (later incorporated into the Mastering Edition bundle, but now discontinued), featuring a variety of drawing tools, a learn mode and a spectrum analyser to display what's happening. 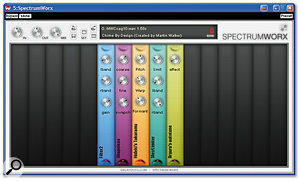 A few more recent plug-ins with spectrum-matching EQ functions include Roger Nichols Digital's Frequal-izer (previously Elemental Systems' Firium), and Voxengo's Curve EQ (with up to 60 bands, built-in harmonic generation and saturation processing for that analogue/tube sound, plus 'GearMatch', which allows you to superimpose the frequency-response ripples for up to two different devices on your curves). Izotope's Ozone mastering plug-in also includes a paragraphic EQ with up to 16,000 bands and soft saturation modelling. One simpler plug-in that nevertheless offers lots of creative potential is Delaydots' Spectral Shaper, an FFT-based 4096-band EQ that lets you convert a WAV file into a frequency response to apply to your audio signals, or you can draw in your own from scratch using a pencil tool. To eradicate minor response wiggles there's a Smooth control, while using the Sharp control further accentuates them. This plug-in was originally designed for such tasks as making vocals sound as if they were coming through a telephone or intercom, but I've found it even more effective for extreme hand-drawn responses: by restricting the output to a few narrow frequency spikes you can turn drum loops into pulsing chords, drones, comb-filters and the like. Soundhack's Morphfilter (one of four plug-ins in Tom Erbe's Spectral Shapers bundle) takes this approach several stages further, with two filter shapes that you can either learn from an audio file or draw in using the mouse. 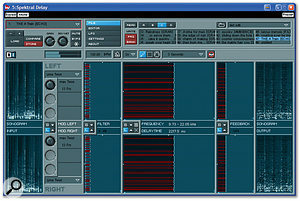 You can then morph between the two, using MIDI automation or an integral LFO that you can sync to the host application. The Filter Depth control has a nominal 1.0 setting, but you can exaggerate the response if you increase the setting to 2.0, reduce it to a flat response at 0.0, and generate an inverse response shape as you reduce it still further to -2.0. There's also an overall Tilt EQ control to balance highs and lows either side of 1kHz. 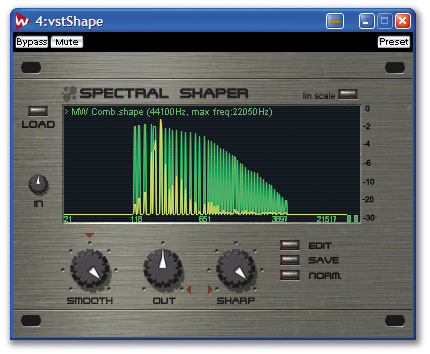 While this plug-in positively encourages special effects use with slowly morphing responses or pulsing changes, it can also be used in more subtle ways, such as reducing unwanted characteristics in a sound by learning the shape of the unwanted frequencies and then using a lower Filter Depth setting to reduce prominent peaks. If you have recorded tracks in a room that has 'honky' acoustics, you could also try recording some white noise in the same room, capturing its response and then using an inverse Filter depth setting on your tracks to automatically reduce the peaks. 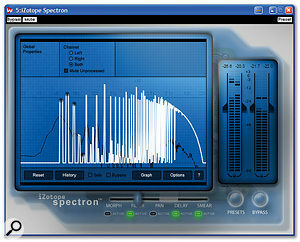 By measuring the amplitude in each spectral band and subjecting it to various rules, you can create unique dynamics processors. A simple, yet powerful example is spectral gating. Unlike a standard noise gate that lets no signal through until it reaches a certain threshold, and then lets everything through, a spectral gate only ever lets frequency bands through whose level exceeds the threshold. 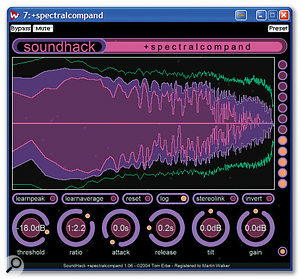 Soundhack Spectral Compand. 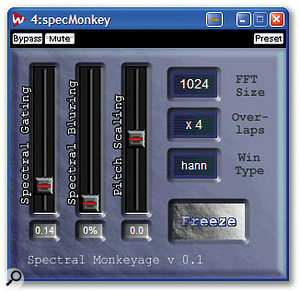 Simple spectral gating using a plug-in like Shiny FX's Spectral Monkeyage is useful for noise reduction or special effects, while the more sophisticated Soundhack Spectral Compand (above) can also increase harmonics and ambience, and flatten frequency response.Shiny FX's Spectral Monkeyage has up to 4096 individual gates, one for each of its frequency bands, but a single slider to set the global threshold level. At low settings you can use it to remove unwanted background noise or low-level harmonics, while at higher settings it progressively removes all but the strongest frequency components, for unusual special effects. It also lets you move the band contents sideways, for crude pitch-shifting, and provides a spectral 'blurring' feedback control for ringing and freezing effects. It's not a subtle plug-in, but is surprisingly versatile for a freeware offering. Rather more sophisticated is the Soundhack Spectral Gate, featuring a set of more traditional dynamic controls with good calibration and metering. The threshold settings of its 512 bands can be further moulded by 'learning' the spectrum of an incoming signal, or you can directly draw the desired response on its spectrum display, with a further global Tilt control to balance the low- and high-frequency threshold settings. Even better, you can switch it between Gate and Duck modes, the latter being useful for reducing prominent frequencies by reducing their gain above the threshold setting. You need to spend some time with it for best results, but it's well worth the effort. 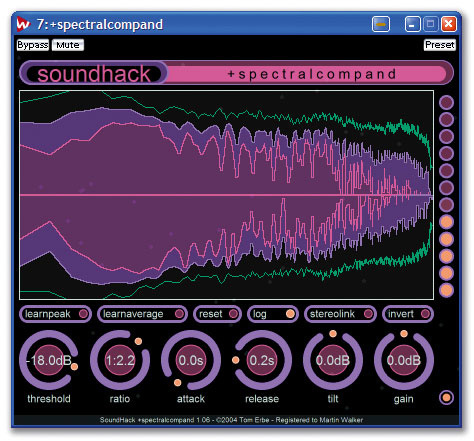 As its name suggests, Soundhack's Spectral Compand takes things further, with a similar set of controls, except that Gain is replaced by Ratio, for compression/expansion effects, and the simple Learn button of the gate is also replaced by Learn Peak and Learn Average buttons, for setting the threshold spectrum according to the incoming signal. An Invert button lets you hear the difference between input and output signals, which in expansion mode is very useful for noise-reduction duties, since you can adjust the other controls to only remove unwanted sounds, without interfering with the desired portion. In compression mode, you can use this plug-in to flatten the spectrum, which generally increases harmonics and ambience, or dynamically reshape it for special effects. Voxengo's Soniformer has some aspects in common with Spectral Compand, in that it offers spectral compression, but it also aims to smooth out the spectral curve using both compression and expansion across 32 bands. Each of its main controls (Threshold, Attack, Release, Ratio, Wet Mix, Out Gain, Stereo Link, Width and Pan) can be altered across the spectrum by clicking and dragging control points in their individual parameter envelope windows. 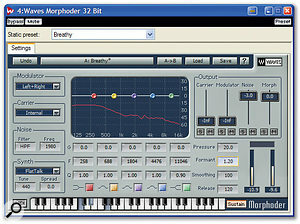 This is sophistication indeed, and makes Soniformer very useful at the mastering stage. The jargon used by many spectral plug-ins can be initially baffling. If you just want to use the presets, you don't need to understand it, but if you want to make your own sounds, understanding the basics can help a great deal. 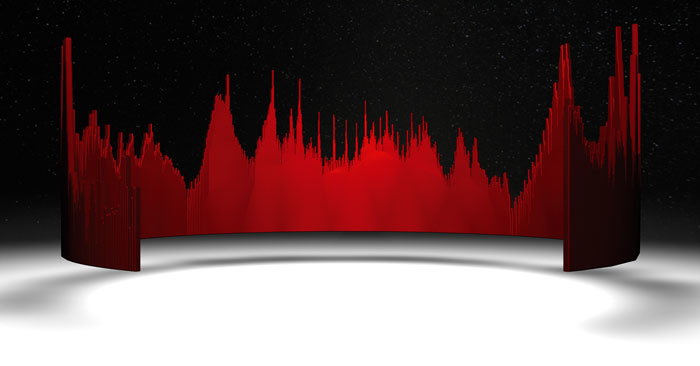 Time Domain: analysing how the amplitude of a signal such as a digital audio stream changes over time. Frequency Domain: analysing a signal in terms of its frequency components. Sonogram: also known as a Spectrogram, this graph displays frequency content in one direction and how it varies over time across the other, while the brightness of each pixel indicates the strength of each frequency band. Transform: an alternative mathematical representation of a signal. Fourier Transform: a mathematical algorithm that converts an incoming time-domain digital audio signal into its spectral components, so that they can be treated in the frequency domain. Once this has been done the signals are passed to a corresponding inverse Fourier Transform to convert the data back into its original form. Bands/Window Size: digital audio is transformed one small FFT block or 'window' at a time, each consisting of a number of samples, and the number of resulting frequency bands is always half this figure. A larger window size therefore increases the frequency resolution, since it results in more frequency bands, but it will also increase the overall latency of the effect. Many spectral plug-ins default to 512 FFT/Analysis bands, and thus divide the audio into 256 frequency bands, which is generally the lowest 'clean' setting. Settings of 128 or 256 result in 'grainy' or otherwise coarser sounds with high-frequency distortion (useful for robotic and metallic effects), while higher values of 1024 or 2048 (if available) won't increase CPU overhead and may clean up the output still further. However, they may also change the tonality of the effect and will significantly increase its overall latency. Window Shape: there's often a selection of Window shapes for the spectrum analysis, since the simplest Rectangular option will produce regular audible glitches as each block of treated data is joined back together, resulting in nasty-sounding artifacts/distortion. The default 'Hanning' window generally gives the cleanest results, and unless you want to experiment you can leave this parameter alone. However, others may give interesting harmonic colouration if this is what you're after. Overlap: since a large window size increases frequency resolution (see above) but also increases latency, you can improve matters by overlapping successive windows — for instance, grabbing a window 512 samples wide every 128 samples (4x overlap). A lower overlap setting provides faster processing and lower latency but lowers resynthesis quality, while a larger overlap results in smoother transitions between blocks and much lower distortion levels, but lots more CPU power consumption. The amount of overlap is the most critical parameter for CPU overhead, so unless you're looking for special effects it's generally better to leave it at its default setting, or keep a close eye on your CPU meter. While EQ-ripping plug-ins let you learn the static frequency response of one sample or track and impose this on your own material, other plug-ins let you apply the spectral characteristics of one sound to another in real time. This is often referred to as 'morphing'. For instance, MP3some's Shapee is a simple plug-in that takes two mono audio signals and creates one mono output signal derived from the amplitude of one and the frequency distribution of the other. Although this twin-mono restriction is initially frustrating, it avoids routing complications with the ever-popular Cubase (which still doesn't support plug-in side-chaining, to let one stereo signal control another), and with a little care the results are surprisingly controllable and effective for a freeware plug-in. 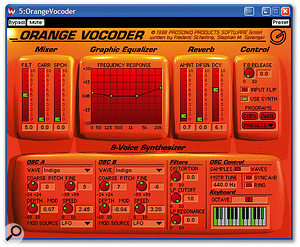 A classic vocoder such as Prosoniq's Orange Vocoder, shown here, can make guitars talk and turn drum loops into a choir. Waves' Morphoder adds formant shifting, so you can change the gender of the voice.Other spectral morphing plug-ins offer stereo in/out capability but avoid side-chaining issues by letting you load in a separate stereo 'target' file that loops in the background while treating your real-time stereo input. 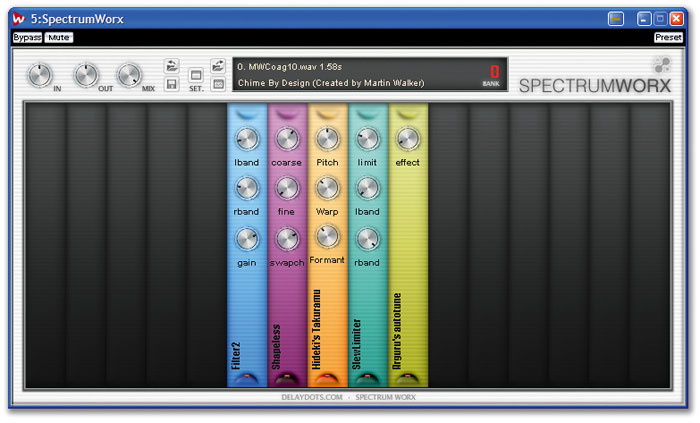 For instance, Delaydots' Spectral Morpher (part of their Spectral Suite) offers both twin-mono and target file options, plus eleven morphing modes, including spectral convolution, various mutations and spectral vocoding. This is definitely one for the special effects enthusiast. While a separate looping target file of continuous sounds such as choirs, organ chords or synth pads works well when morphed with rhythmic sounds such as drum tracks, if you choose a rhythmic sound for your target, such as a drum loop, the morphing effect will freewheel and not stay in sync with the input signal. To overcome this limitation, Delaydots' Spectrumworx provides the option to retrigger the target sample via MIDI notes, while Izotope's Spectron provides level-sensitive envelope triggering and LFOs syncable to the host sequencer, to a similar end. I'll be covering these in more depth in the next section, since they both qualify as spectral multi-effects. Vocoding (a contraction of 'Voice' and 'Encoder') is essentially a specialised form of multi-band morphing that can give instruments a more realistic, vocal-like articulation, by adding the 'unvoiced' or plosive sounds such as 'S' or 'T' via a high-pass filter, or generating them internally using a built-in noise generator. In vocoder jargon, the morphing 'target' sound is known as the 'carrier signal, while the voice or guitar that articulates the carrier is the 'modulator' signal. Early hardware channel-vocoders were analogue devices using between 10 and 24 band-pass filters with extremely steep slopes (typically between 60dB/octave and 96dB/octave, compared with the 12dB/octave or 24dB/octave employed in most synthesizer filters). To achieve this steepness, extremely low-tolerance components need to be used, which is the main reason why analogue vocoders tended to be so expensive, and why they often sounded different from each other. Fortunately, there are now quite a few vocoder plug-ins available, ranging from simple freeware to complex commercial products and employing a variety of design approaches. 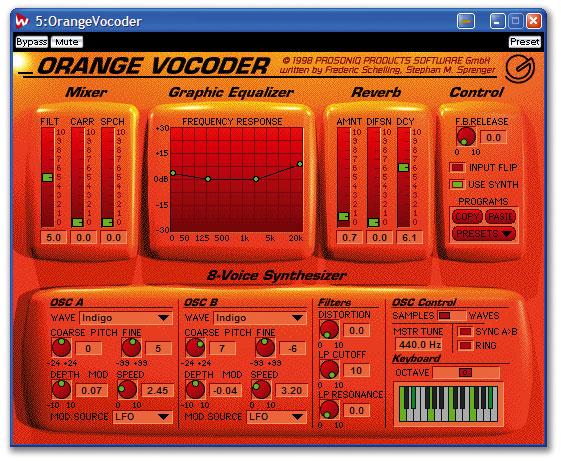 Some developers simulate traditional analogue designs, such as Prosoniq with their 24-band Orange Vocoder plug-in, 'for a warm and transparent sound', although it nevertheless incorporates an 8-voice digital synth with on-screen keyboard as one carrier option. Waves use a similar 8-voice synth in Morphoder, and this plug-in also features formant-shifting technology, so you can change the character of your voice and simulate guitar Talkbox effects (where the sound is directed into the performer's mouth, so that it can be articulated). Whereas channel vocoders deal with amplitude information, various other developers use phase vocoder algorithms that split the incoming signal into many more bands (typically 512 or more) and analyse both amplitude and phase information for each band, so they can use the phase information from one channel and apply to it the spectral envelope from the other channel. Examples can be found in Propellerheads' Reason (up to 512 bands) and NI's Vokator (1024 bands). Vokator is also unusual in that it incorporates a sampler with granular synthesis features as well as the more normal integrated synth, and even supplies a set of spectral effects for each channel, like those of Spektral Delay (see next section). Although this versatility can be daunting to the newcomer, Vokator is capable of a huge range of treatments. To finish this section I should point out that in the film world morphing is now generally regarded as gradually changing one object into another (as famously featured in the film Terminator 2) so, strictly speaking, audio morphing should gradually change one sound into another. To do this properly requires rather more sophisticated techniques than offered by the morphers/vocoders above. However, if true morphing is the effect you're after, take a look at Prosoniq's Morph, which uses artificial neural networks for pattern recognition to create the in-between shapes. As I was researching this feature I found links to various unusual and experimental freeware VST spectral plug-ins. Their graphic interfaces may be primitive (or even non-existent) and they are supplied 'as is' with no guarantees, so some may not be fully stable under all conditions. However, most VST plug-ins comprise a single DLL file that you drop into your VST plug-ins folder, and if you hit any problems you can quickly and easily remove them. I enjoyed MP3Some's Wavethresh and Ether; the Sp3ctr3 FFT-based audio-mangling plug-in; Thaw, by Cormac Daly; and Twisted Lemon's FFTfun. Once you've gone to the trouble of converting an input signal into its spectral components for treatment, it's little more trouble to subject these to several serial effects than to a single one, before converting back to the original time-domain version. But because even a simple mathematical transformation in the spectral domain can result in radical changes to sounds, we now enter the 'outer limits' of plug-in effects. One of the first spectral multi-effects to be released, and still one of the most sophisticated, NI's Spektral Delay is a treat for ears and eyes. 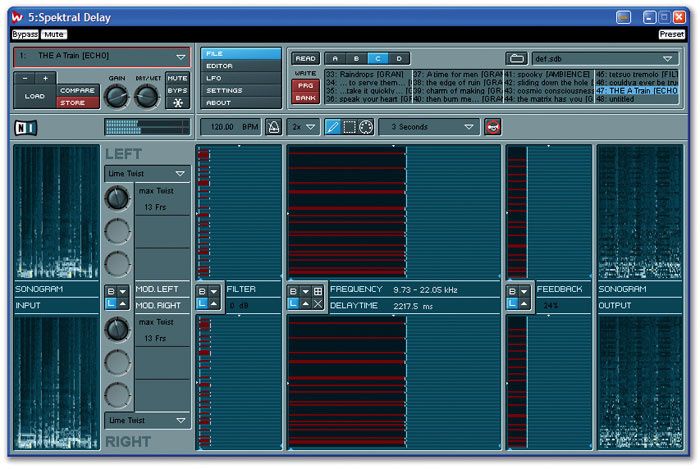 One of the first developers to enter this previously uncharted territory was Native Instruments, with their very ambitious Spektral Delay. It has an extremely elegant graphic interface featuring twin stereo sonogram displays for input and output, and the signals pass through up to four effect stages. The first is Input Modulation, offering your choice of one of 13 spectral insert effects that can transform the sound in radical ways. Some can be found in other plug-ins, while others are unique, offering exotic spectral comb and bandpass filtering, random frequency re-ordering, smearing or scrambling of the magnitude and phase information, or time-shifting or enveloping of the incoming data blocks. Yummy!Next up is is a spectral filter into which you can draw your own exotic response shapes, and then we come to the two effect blocks that give Spektral Delay its name: you can define different delay times and feedback amounts for each up to 1024 available frequency bands simply by drawing an on-screen shape with your mouse. The possibilities are jaw-dropping, but the 'draw your own' matrix boxes keep things very manageable, especially with their quantise options for easily making some frequency-band delays multiples of others using the snap-to-grid option, and the external temp sync options. Spektral Delay is loved by its many users and is incredibly versatile, although sadly it's let down by one of the most confusing preset management systems ever devised. Capable of morphing, spectral filtering, panning, and delays, Izotope's Spectron is another spectral tour de force with great potential.Darrell Tam's Block FX (DtBlkFx) is a plug-in with a colourful graphic display featuring two spectrograms to let you see how your signals are being altered in the spectral domain, and with up to four effect slots into which you can insert any combination of 29 spectral treatments chosen from the drop-down list. The effects include a radical EQ, spectral compander and clipper, mirror (swapping frequency bands), resampling over a +/-3 octave range, four pitch shifters, two harmonic pitch shifters, two comb filters, five that change the harmonic envelope in various pre-defined ways, six masks that let you apply other effects to the harmonics of a particular note, a vocoder, and two harmonic matching vocoders. The scope for radical transformations is vast, and if this plug-in had a more sophisticated graphic interface it could sell for serious money, so snap it up while it's still freeware! Izotope's Spectron has an elegant, sophisticated graphic interface offering real-time spectrum analysis, and comprises four series-connected spectral modules, plus a more traditional 'Smear' section featuring four 'analogue' modulated delays for phase/flange/echo effects. I've already mentioned its very tweakable Morph module, and the other three are Filter, Pan and Delay, which all benefit from a clever system of four 'nodes' that you can drag to define frequency bands and create exotic pass-band shapes and harmonic series. These nodes can be further manipulated via advanced LFO and envelope modulation. For those prepared to boldly go where no one has gone before, the 16-slot rack and 45 modules of Delaydots' Spectrumworx provide huge potential for effect transformations both subtle and extreme.You can use the Spectron modules to define different delays for frequency bands, move different parts of the spectrum to different positions and subject them to radical EQ treatments, all with real-time movement. Although the many supplied presets illustrate its sophisticated 'musical' potential, it's also capable of plenty of more outlandish effects that will appeal to spectral experimenters. Finally we come to Delaydots' Spectrumworx, the most free-form offering of all. Its modular 'rack' interface provides no fewer than 16 effect slots, into which you can insert any combination of a staggering total of 45 modules. Some of the many treatments on offer include pitch-shifting, mathematical operators and vocoding, plus exotica such as spectral interpolation, phase vocoding, transient extraction and slew limiting, while many modules offer the option of morphing or otherwise combining the input signal in some way with a modulation sample. This free-form approach does have its disadvantages, since it's easy to stray towards the two extremes of anarchy and distortion or total silence, but loads of presets are included for the more casual user. However, you don't need to understand what each module does when creating your own presets: just explore and see what happens. Spectrumworx can transform an audio track in a multitude of ways, and moving just one of the module controls in real time can also often result in jaw-dropping transformations that you can automate using MIDI controllers. This plug-in won't be for everybody, and it would really benefit from some LFOs, but if you're after completely unique sounds it's the bee's knees!